Excitedly retire the old iPhone to embrace Android for a better experience but sadly find that you lack the suitable file sharing approaches to transfer the music library from iPhone to Android? This is very common for those who switch from iPhone to Android because the two systems don’t support each other. Will you give up the wonderful songs bought from iTunes? Hold on! iPhone to Android music transfer is indeed tricky but it’s not unfulfillable. 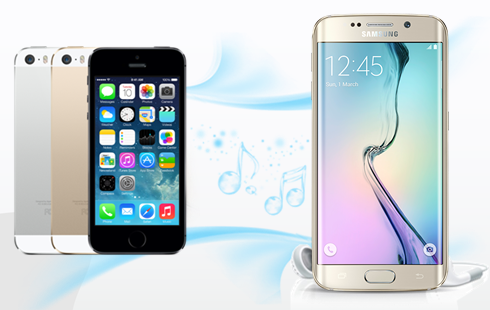 Here we’ll show you how to transfer songs from iPhone to Android phone with or without iTunes. Moving iPhone music to Android without iTunes is not that complicated as you imagine. There are many third-party tools available can help you to do that easily. Take Jihosoft Phone Transfer for example, it provides users with a reliable method to directly transfer music, contacts, text messages, calendar, as well as photos and videos from iPhone to Android by one click. Want to see how all this happens? Follow the below steps. Download and install this iPhone to Android Transfer tool on your PC. Then run it. Choose “Music” from the listed file types and click “Start Copy” to begin transferring music from iPhone/iPod to Android. So easy, isn’t it? Just ensure your devices are connected to the computer all the time during the process. You can transfer music from all iOS devices including iPhone 3GS/4/4S/5/5S/6/6S/7/7 Plus/8/X to the latest Android phones like Samsung Galaxy S9/S9+, Huawei P20, OnePlus 6, LG G7, HTC U12 Plus, Xiaomi Mix 2, etc. The cloud-based Google Play Services, which reliefs users of all kinds of cables, is another convenient way to transfer data between two different devices. Let’s see how to sync iPhone music to Android with Google Music. First of all, sync your iPhone music to iTunes. Run Music Manager and select “iTunes” as the location of your music files, the app will upload all your iTunes songs to Google Play. Run Google Play Music app on your Android, tap the top bar to switch to “All Music”, you should be able to see all your iTunes songs that you uploaded to Google Play. 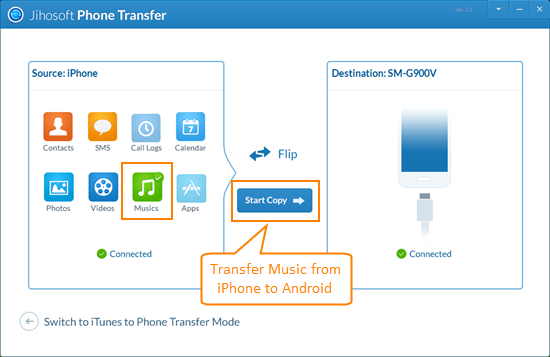 Although iTunes doesn’t support to copy music from iPhone to Android, you can still use iTunes to transfer your iPhone music to the computer first, and then simply drag & drop the songs from computer to your Android phone. Connect your Android phone to the computer as an removable drive with a USB cable. Open the iTunes media folder. Then drag and drop the songs into your Android music folder.